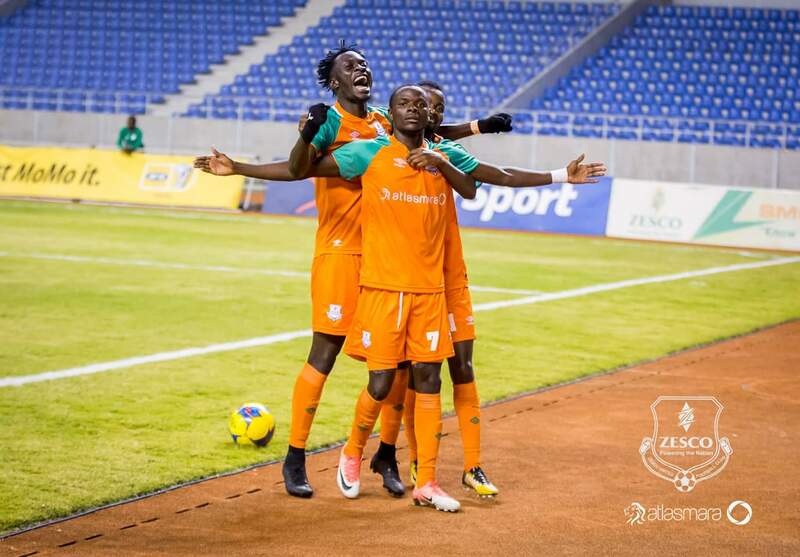 Lazarous Kambole on Saturday August, 18th scored three goals in five minutes in Zesco United’s three nil win over Mbabane Swallows to ink his name in the history books as the player with the fastest hatrick recorded in the history of the CAF Champions League. The five minutes of heaven started in the 38th minute as the Zesco talisman finished off a rebound from close range after his initial shot was saved by Sandanezwe Mathebula following a good interchange of passes. Two minutes later the 24 year old striker struck again getting his second following a defensive error at the back for Swallows who allowed the Zesco United goal poacher a chance to pick up a lose ball at the edge of the box which he finished off perfectly. The 24 year old completed his hat-trick two minutes before the break flicking on a pass from midfield to beat his marker before chipping Mathebula who was a long way from his goal. Kambole’s hat-trick smashed the European record set by former French striker Bafétimbi Gomis. Gomis, during his time at Lyon, set the record for the fastest Champions League hat-trick that he scored in 8 minutes against Dinamo Zagreb in a group stage match. But just less than two years ago Kambole was very low on the perking order at Zesco United and most of the time was just warming the bench. Kambole started his football career in Chingola, a small town in Zambia’s Copperbelt Province, the country’s copper-mining region, with a population of approximately 157,340 people. As a young boy Kambole played for Kabundi Young Stars. In 2004, he joined a Copperbelt amateur side Mindolo Young Stars where he played for just two seasons. In 2006, he moved to Chililabomwe were he joined an academy called Malalo Academy which was also playing in the same league. In 2010, he joined FAZ division one side Konkola Mine Police which gained promotion to premier division the following year. In 2013, he moved to Konkola Blades where he only played for a season before joining his current Club Zesco United in 2014. In 2015 when Winston Kalengo was leaving for Congo Brazzaville he requested Zesco United team manager Mabvuto Banda to hand the number 10 jersey to Kambole just after playing with him for two years. “I have confidence in Lazarous Kambole and I believe he is the next best striker at Zesco United, so please give him jersey 10 next season,” He said. Despite taking long to come to pass, Kalengo has been vindicated. True to his words the former Kalulushi Modern Star striker has lived up to the hype from his fellow Zesco United striker. The 2017 Super League was the season the pacey forward first made his true mark on the Zambian football scene. He started the season on a high opening his account for the season on match day one, in Zesco’s two nil win over Konkola Blades. A brace on match day three in the 4-1 win over Nchanga Rangers gave Kambole an early season Golden boot race lead and everything was going his way. Jesse had only scored once at this point and the goal was from the penalty spot. Due to unknown circumstances, Kambole suffered a five months goal drought with some sections of Zesco fans making him a target of abuse consequently even losing his place in the team. Game-time rarely came by and was mostly from the bench. Luckily for Zesco United Jesse Were had found his scoring boots and was leading the way. As fate may have it Kambole was back at it again scoring his first goal in over five months in the three nil win over Lusaka Dynamos in Lusaka. Kambole then went on a five game scoring spree to help Zesco keep pushing for the 2017 super league title. The next weekend he scored Zesco United’s goal in the one all draw with Power Dynamos before scoring a brace the weekend after as Zesco United thumped City of Lusaka four goals to one. Three days later in a rescheduled week 30 match Kambole scored Zesco United’s only goal as they beat Kabwe Warriors one nil. Kambole was again on hand to score for Zesco in their one all draw with the police sponsored out-fit Nkwazi on match day 33. He established himself as an important player in the starting line-up although he did not score in the next four games he had already done the hard work and was now an integral part of the United set up. On the final match day he set up John Ching’andu for the opener then Jesse for his second goal before putting his name on the score sheet. No wonder he was awarded as the most improved player and the club’s most valuable player at the end of year awards gala. Kambole made his Chipolopolo debut on 14th January 2018 in a 2018 African Nations Championship group B encounter against Uganda. In a match played at the Stade de Marrakech, Marrakech, Morocco; Kambole made his start for the Copper Bullets and just needed 38 minutes to net his first competitive Chipolopolo goal as he got on the end of an Enerst Mbewe cross to slot the ball between the legs of Ochan in the Uganda goal. His stellar start to life with the national team did not go unnoticed as the then Chipolopolo coach Wedson Nyirenda showered praise on. “There is nothing that gives coach a lot of pleasure than when you believe in a player and he responds in that style. The boy is starting to believe in himself, getting more and more confident. I think the young man has a lot to show,” he said. Kambole netted his second Chipolopolo goal on 22nd January in the final group game against Namibia as he helped the copper bullets to a one all draw. 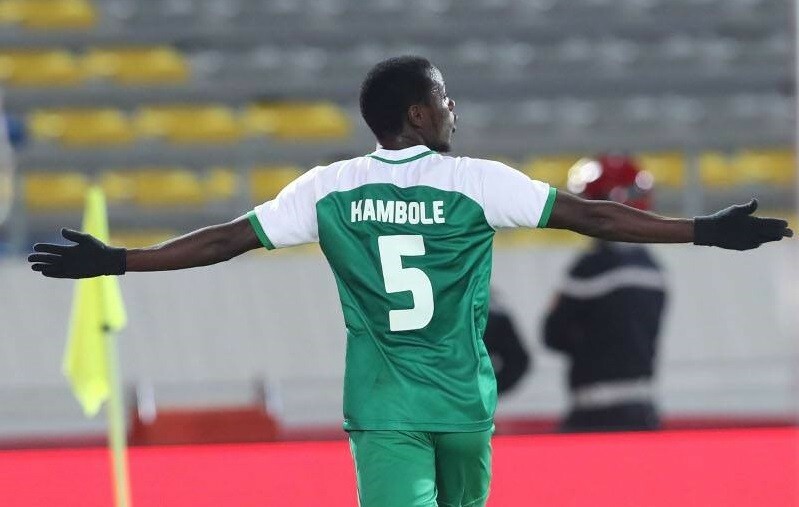 Zambia went on to lose the quarter final to Sudan but Kambole had announced his arrival at the international stage and the country was eager for more. The next stop for the Zesco United goal poacher was the four team tournament hosted in Ndola in March this year. 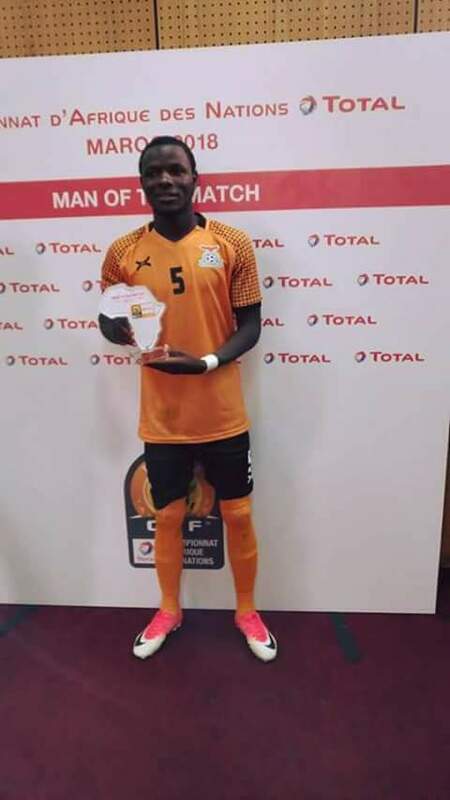 Lazarous Kambole scored the winning penalty for Zambia on Wednesday, March 21st to set up a crunchy encounter against South Africa in the final of the four team tournament after coming on as a substitute to score a last gasp equaliser and force the match to penalties. Zambia lost the final to South Africa thanks to a Percy Tau brace but Kambole had once again showed glimpses of what he was capable of doing. Fast forward June 2018, The COSAFA senior Challenge came alive and coach Beston Chambeshi drafted the pacey forward in his squad. He started the campaign on a slow note missing a post-match penalty in the quarter final encounter against Namibia but Zambia came out tops winning 4-3. The next opponent for the Copper Bullets was Madagascar who had eliminated the hosts South Africa on post-match penalties in the quarter finals. Kambole scored the only goal of the game to propel Zambia to their second COSAFA final in two years. The final was a repeat of the 2017 final as Zambia went head to head with Zimbabwe. It was dejavu all over again as the Warriors scored a dramatic last ditch equaliser to take the Cosafa Cup final into extra time and then Khama Billiat netted twice to retain the southern African championship with a dramatic 4-2 victory over perennial foes Zambia in the final. But before the final few minutes Zambia were in pole position to revenge their 2017 loss thanks to Lazarous Kambole’s two superb goals on both sides of half-time to put Zambia 2-1 up. Since his debut on 14th January Kambole has scored six times for Chipolopolo and may increase his tally next month after being named in coach Sven Vandenbroek’s 26 man squad to face Namibia in a Cameroon 2019 AFCON qualifier. The ZamFoot Crew caught up with the 24 year old to find out a few things like what drives him to work hard and the people who have had the biggest impact in his life. ZamFoot: Which coaches had the biggest impact on your career? Kambole: The coaches that have made the biggest impact in my life are a lot like Mr Godfrey Siame who was my coach when I was with Konkola Mine Police. Mr Beston Chambeshi when I was with Konkola Blades. Mr Tenant Chembo, Mr Alfred Lupiya and Mr George Lwandamina here at Zesco United. I have learned a lot from them not only football but life in general and I will forever be grateful to all of them for all that they have done in my life and may God richly bless them. Kambole: What drives me to work hard is my family, they are so dear to me. They are so important to me and they are always there for me through thick and thin. We have suffered together and we have enjoyed together. Their love and support for me is what drives me to go an extra mile in all that I do. ZamFoot: Do you harbour any ambitions of playing outside Zambia? Kambole: It’s every players dream to play outside the country and that has always been my dream and if that happens I will be very happy. ZamFoot: You are now a record holder how do you feel about that? Kambole: On breaking a record, Well of course I am happy; it’s an unexplainable feeling and humbling to be found in the same book with the likes of Neymar, Ronaldo just to name a few. As things stand it’s clear Kambole has a promising future and if he can continue working hard he might just ink his name in the Zambian football history books but only time will tell. Guys you are really writing good these days. Don’t make mistake by benching Patson or super machine Augustine Mulenga, on expense of Kambole. Not taking anything away from Kambole. We have seen that before. Well done Chingola,putting yourself on the map!! Wishing LK all the best and hoping he can emulate C Mbesuma!!! The last sentence should be modified. Since Kambole has already done this. All we need is high level coaching to transform the team otherwise we now have sufficient talent in our chipolopolo team. I dont even see how Rainford Kalaba and even Lazarus kambole can start in this team. Which positions do they take? My question is? Is FAZ willing to pay the cost of a high level coach??? Where is the money gonna come from?? ?